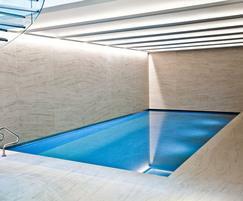 This elegant subterranean pool and leisure area was part of the £5.8 million luxury remodelling of a family home located around the corner from Abbey Road Studios in London NW8. 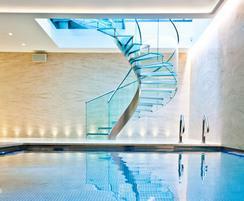 The pool is located in a large double basement development in the rear garden. 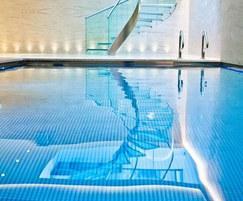 In addition to the swimming pool, the wellness area includes a fully air conditioned gym, steam room, lounging / yoga room and changing facilities, all finished in shades of sand to harmonise with the understated colour palette of the rest of the property. 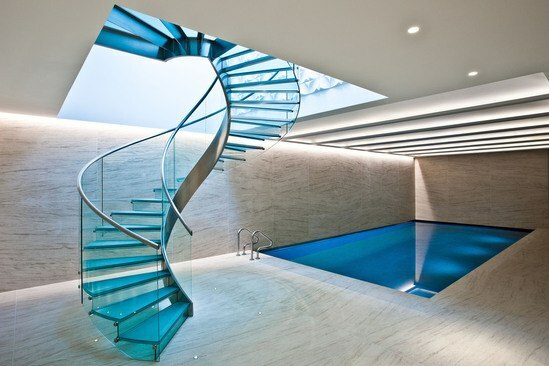 The space is directly connected to the lower ground floor of the main house by means of a spectacular glass staircase which complements the glass mosaic tiles of the interior of the pool. 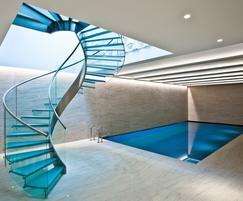 The spiral stairway provides a beautiful focal point as well as an abundant source of natural light which enters via the opening from the glazed atrium above. Ambient lighting in the area is streamed from inside recesses within the ceiling. The client brief was to install the largest pool that could comfortably sit within the area and dimensions of 9x4m were achieved. This is something that LSPC always recommends as it rapidly becomes a much used feature of the house. The Italian glass mosaic tiles presented a precision fixing challenge in that they are clear so any imperfections behind them would show through and the thickness of 10mm required them to be drilled as opposed to cut when matching up around fittings. The underwater LED lights and fixtures are 316 grade stainless steel and provide an attractive contrast to the earth colours and materials used elsewhere. 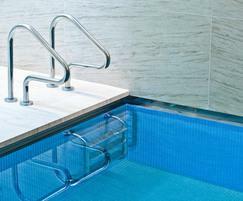 To accommodate some vigorous fitness swimming, a counter-current unit was installed at one end – a powerful jet against which you can swim on the spot. The pool part of the project took a year to complete, which included a lengthy design and testing process with some special features. Architect Stuart Forbes Associates introduced the stylish stainless steel water line detail for which several mock-ups in aluminium were required in order to achieve the exact measurements before the final template could be created for the costly polished stainless steel fabrication. The pit which houses the automatic pool cover making it disappear from sight when it is rolled back, is hidden behind a suspended wall above the water line and a concrete wall below the waterline separated by a 100mm slot for the cover to slide through. The swimming pool and plantroom look very neat and simple but are the result of complex planning, high dimensional accuracy and demanding team work.